CARSON, Calif. — At Pack Expo in Chicago next week, Epson Robots plans to launch the SynthisTM T6 all-in-one SCARA robot as well as Force Guide, a high-performance, integrated, force-guidance solution. The company will also showcase various leading robots for factory automation and lead a discussion for users new to factory automation. The Synthis T3 and new T6 all-in-one SCARA robots offer the perfect way to automate factories without wasting time or money on expensive, complex, slide-based solutions, according to Epson Robots. They come with a built-in controller, a new feature that is designed to reduce space requirements and simplify setup. The robots also include the powerful Epson RC+ ® development environment that is included with all Epson Robots. The Synthis T3 and T6 are ideal for simple applications such as pick and place, assembly, parts handling, and dispensing, said Epson Robots. The company added that they can be used in industries ranging from automotive and medical development to lab automation, consumer electronics, electronic components and industrial. Both robots will be shown with Vision Guide demonstrating inspection as well as pick and place applications using vision guidance. The Flexion™ N2 6-Axis space-saving robot features the world’s first compact folding arm design that meets the increasingly high demands for efficient movement and precise placement required in advanced manufacturing. Epson Robots said the Flexion N2 is ideal for use in production and quality assurance in the automotive, electronics, medical and laboratory equipment industries. These markets require smaller robots and workcells, it said. At Pack Expo, Epson Robots will give a presentation on the Innovation Stage entitled “The Starting Point for Robot Automation: A Beginner’s Tour.” The speaker will be Rick Brookshire, group product manager at Epson Robots. This presentation will serve as a starting point for those new to automation. Epson Robots plans to provide attendees with a good understanding on how to get started with robotics and key considerations. The session will be on Monday, Oct. 15, 2018, from 11:00 a.m. to noon at Booth N-4570 in McCormick Place. Epson’s booth is N-4704. Epson Robots is a global leader in PC-controlled precision factory automation. 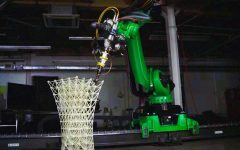 It has an installed base of well over 65,000 robots worldwide and a product line of hundreds of models of easy-to-use SCARA, Cartesian, and six-axis robots using a common PC-based platform. Building on a 35+-year heritage, Epson Robots today delivers robots for precision assembly and material handling applications in the aerospace, appliance, automotive, biotechnology, consumer product, electronics, food processing, medical device, pharmaceutical, plastics, semiconductor, and telecommunication industries. For more information, visit www.epsonrobots.com. Epson is a global technology leader dedicated to connecting people, things, and information with its original efficient, compact, and precision technologies. The company’s lineup ranges from inkjet printers and digital printing systems to 3LCD projectors, watches and industrial robots. Epson is focused on driving innovations and exceeding customer expectations in inkjet, visual communications, wearables, and robotics. Epson America Inc., based in Long Beach, Calif., is Epson’s regional headquarters for the U.S., Canada, and Latin America. To learn more about Epson, please visit: Epson.com. You may also connect with Epson America on Facebook, Twitter, YouTube, and Instagram.